"Published in July 2013 by PS Publishing..." (over) "First Edition" stated on the copyright page. "Cover: Copyright © Walter McDougall (1858-1938) 2013" stated on the copyright page. "Design and Layout by Aaron Leis." stated on the copyright page. This edition was issued without dustjacket, with the artwork adhered directly to the book's boards. "Cover Art by Walter McDougall, 1858-1938" (over) "Cover Design by Michael Smith" on the back cover. The ISBNs of both this trade edition and the signed edition (978-1-848636-11-8) are on the copyright page and the back cover, where the price for each is also given. This is a collection of satirical pieces, which can not be classified as either fiction or essay. The verifier of this record has chosen to keep the type that was given to the piece by the ISFDB editor who created the title record when it was first published. In some cases, the designation appears to be somewhat arbitrary. The pieces published on pages 163 through 204 appear under the group title "The Locus Online April Fools' Day Stories" even though research has shown that some of them may not have been published on the Locus website. The titles of a couple of them have obvious typographic errors which have been retained here based on ISFDB entry standards. The acknowledgements on the copyright page indicate that "Ultrasenator Versus the Lobbyists From Beyond!" 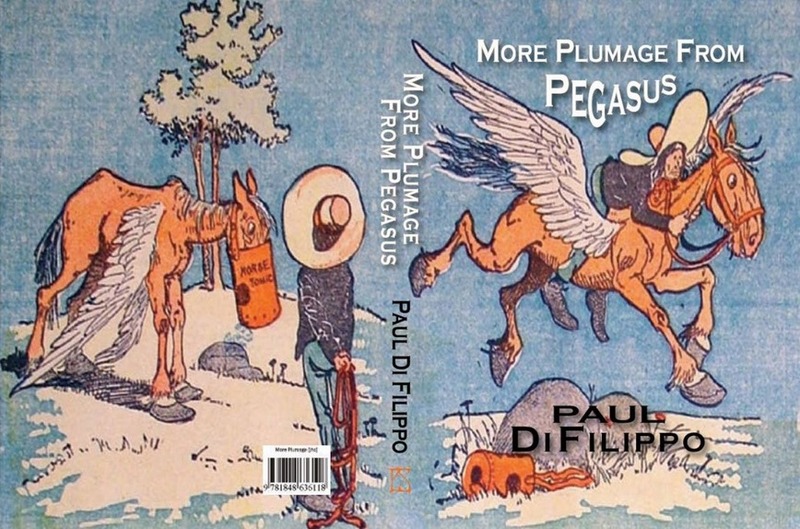 appears here for the first time, even though it was first published in the first Plumage from Pegasus collection. There is no OCLC record for this edition as of 2016-02-26.